Knockout or next round? All eyes towards the battle between Uber and London’s transport regulation system ‘TfL’. Employee conditions and security affairs are the big issues in this public discussion. Is there a bright new future for digital labor or is it the latest update of exploiting capitalism? Who will win the fight? In an official statement, London’s official transportation regulator ’Transport for London’ announced that they declined Uber’s request of proceeding their transport licence. TfL declared that Uber’s shortage of corporate responsibility for public security is one of the main issues. Therefore, Uber’s users are not allowed to use this service anymore. So far, Uber is granted to operate until the licence runs out at September 30. Until now, Tom Elvidge said in a statement the decision affects more than 3.5 million people in London who use the Uber application. Furthermore, 40,000 licensed drivers would lose their job. He attacked the decision by claiming that London shows adverse reactions towards innovation. To defend its biggest market, Uber intend to appeal to a court. ” 3.5 million Londoners who use our app, and more than 40,000 licensed drivers who rely on Uber to make a living, will be astounded by this decision. By wanting to ban our app from the capital Transport for London and the Mayor have caved in to a small number of people who want to restrict consumer choice. If this decision stands, it will put more than 40,000 licensed drivers out of work and deprive Londoners of a convenient and affordable form of transport. To defend the livelihoods of all those drivers, and the consumer choice of millions of Londoners who use our app, we intend to immediately challenge this in the courts. Drivers who use Uber are licensed by Transport for London and have been through the same enhanced DBS background checks as black cab drivers. Our pioneering technology has gone further to enhance safety with every trip tracked and recorded by GPS. We have always followed TfL rules on reporting serious incidents and have a dedicated team who work closely with the Metropolitan Police. As we have already told TfL, an independent review has found that ‘greyball’ has never been used or considered in the UK for the purposes cited by TfL. Londons mayor Sadiq Khan reacted to this statement by saying that innovation and new technology are an important part of London; Nevertheless, every part needs to fulfil its duty and follow the laws. Safety and security have first priority and thats why he supports the TfL’s decision. ” I want London to be at the forefront of innovation and new technology and to be a natural home for exciting new companies that help Londoners by providing a better and more affordable service. However, all companies in London must play by the rules and adhere to the high standards we expect – particularly when it comes to the safety of customers. Providing an innovative service must not be at the expense of customer safety and security. I fully support TfL’s decision – it would be wrong if TfL continued to license Uber if there is any way that this could pose a threat to Londoners’ safety and security. The Uber community is shocked by the regulations of the TfL. Anxiety and fear spread among the 40.000 London-based drivers who use Uber for living. Uber is permitted to keep operate as usual in the city, connecting customers and drivers through their widespread application. Uber’s driver are considered self-employed contractors which means they do not receive the unemployment benefits. On the other side, Uber is not known for treating their contractors fair. The critics claim that Uber failed to solve issues like sexual assault by passengers or drivers. In the past, several cities, like Austin or Philadelphia tried to prohibit Uber from operating in their area, in the end, the prohibition was temporary. Still, Londons regulators seem to be more serious about this topic and the result could be different. This tweet ultimately shows what kind of impact the Uberization has on society. Furthermore, it demonstrates the technological evolution. Nichols, Carol (Carols10cents). 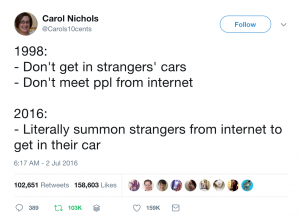 “1998: – Don’t get in strangers’ cars – Don’t meet ppl from internet 2016: – Literally summon strangers from internet to get in their car.” 18 July 2013, 12:00 p.m. Tweet. The question is how long will this appeal process last? Months, or even years? This spectacular situation helps neither the public or drivers. The new trial of regulation could end in a disaster out of Uber’s perspective. London is the biggest market and consequently important to the Uber community. Source: Pasquale, Frank. “Two Narratives of Platform Capitalism.” Yale L. & Pol’y Rev. 35 (2016): 309. Uber has faced a lot of regulation issues on a global scale. In most of these cases Uber has got away with only a black eye because the bans were temporary instead of being strictly enforced. The future is unwritten and the next steps unpredictable. Uber needs to understand its responsibility for fair labor and user security.In short, Uber can not play outside the rules. The debate between ‘shared economy’ and ‘platform capitalism’ does not find and an end in this paper. Although, Uber shows innovation there regulation still need to be discussed. Christensen, Clayton M. “The innovator’s dilemma.” When New Technologies Cause Great Firms to Fail (2010): 977. Dudley, Geoffrey, David Banister, and Tim Schwanen. “The Rise of Uber and Regulating the Disruptive Innovator.” The Political Quarterly (2017). Cannon, Sarah, and Lawrence H. Summers. “How Uber and the sharing economy can win over regulators.” Harvard business review 13.10 (2014): 24-28. Dillahunt, Tawanna R., and Amelia R. Malone. “The promise of the sharing economy among disadvantaged communities.” Proceedings of the 33rd Annual ACM Conference on Human Factors in Computing Systems. ACM, 2015. Rade, Roxana, and Stephanie Borg Psaila. “‘UBERISATION’DEMYSTIFIED: EXAMINING LEGAL AND REGULATORY RESPONSES WORLDWIDE.” (2017). Pasquale, Frank. 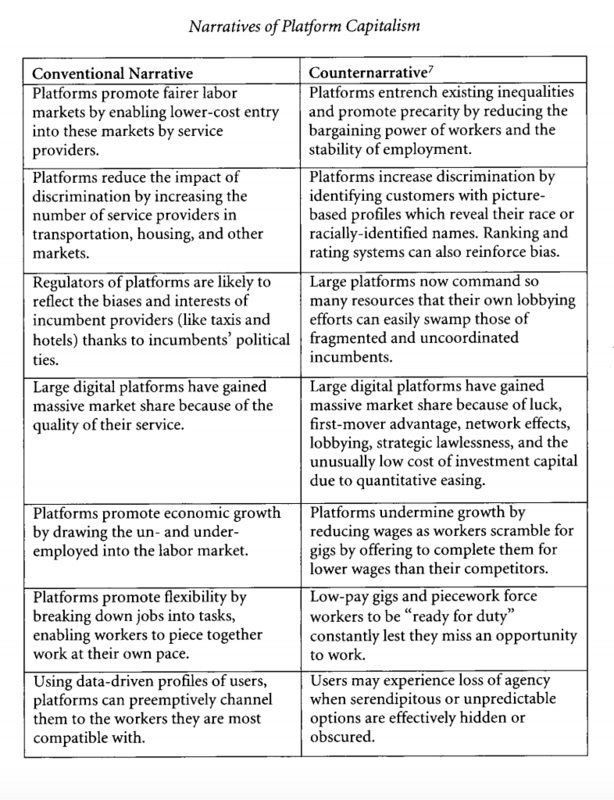 “Two Narratives of Platform Capitalism.” Yale L. & Pol’y Rev. 35 (2016): 309. Srnicek, Nick. Platform capitalism. John Wiley & Sons, 2016. Source: Two Narratives of Platform Capitalism.” Yale L. & Pol’y Rev. 35 (2016): 309. Rixi: The Altruistic Transporter or the new Capitalistic Platform?